Transformative, amazing, gracious and fortunate were among the words used by four Southern Illinois University Edwardsville School of Nursing (SON) graduates as they recalled the global service trips they participated in during the fall 2017 semester. Having earned their master’s of science with a family nurse practitioner specialization during SIUE’s December commencement ceremony, the students are entering the healthcare field equipped with not only extensive academic knowledge and strong clinical skills, but also a global perspective and deep passion for humankind. Myndee Camerer, Marissa Collier and Greg Jennings traveled to Guatemala during Oct. 3-11 with Bernadette Sobczak, instructor of family health and community health nursing. Lorilee Sebesta spent Oct. 25-29 in Haiti, along with Valerie Griffin, DNP, assistant clinical professor of family health and community health nursing. Sebesta completed 40 clinical hours during her service trip in Haiti. While there, she and Griffin provided care for both children and adults, including patients with hypertension, skin issues, diabetes, cough, hygiene issues, malnutrition and those needing topical fluoride therapy. Griffin laid the foundation for the SIUE SON to take students on service trips when she traveled to Haiti last year. She is passionate about the transformative changes students experience while providing care outside of the U.S.
“This experience opened my eyes to global care and how much more we can do both in the United States and across the globe, to ensure people receive the medical care they need, when they need it,” said Jennings, a Joliet native. Those who traveled to Guatemala completed 70 clinical hours, caring for approximately 135 patients a day. According to Sobczak, in Guatemala, they took health histories, performed physical assessment, diagnosed acute and chronic illnesses, provided treatments, and prescribed and dispensed medications. They provided care for infections, parasitic diseases and waterborne illnesses, among other complex cases of chronic conditions that had gone untreated or undertreated for some time. Continuity of care is hugely important to those involved in service trips. Sebesta has already booked a medical service trip to Haiti. Griffin is slated to go back next fall. Meanwhile, Collier is traveling back to Guatemala for a service trip in April. Additionally, Griffin, three other SON faculty, and SIUE Chancellor Randy Pembrook will visit Costa Rica in March 2018, along with 13 undergraduate nursing students from the SON. Their service trip is in conjunction with CAMP (Central American Mission Projects), which Pembrook brought to SIUE. For those interesting in donating medical supplies or other items for future service trips, contact Griffin at vgriffi@siue.edu. 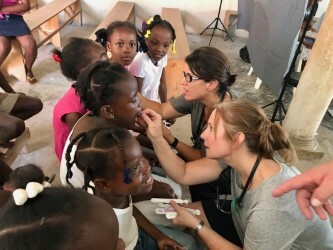 Photos: Valerie Griffin, DNP, assistant clinical professor in the SIUE School of Nursing, and nursing graduate student Lorilee Sebesta, apply fluoride to Haitian children’s teeth during their Oct. service trip. 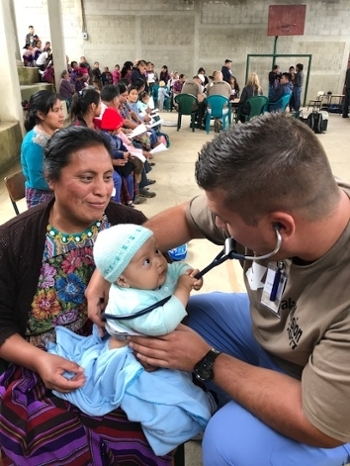 SIUE School of Nursing student Greg Jennings provides care for a baby in Guatemala. 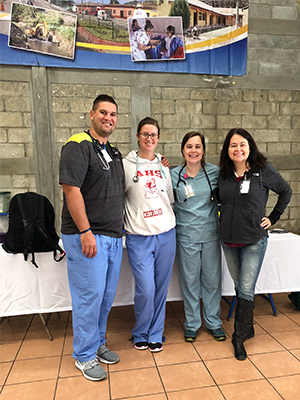 (L-R) Greg Jennings, Myndee Camerer, Marissa Collier and SIUE School of Nursing instructor Bernadette Sobczak traveled to Guatemala in October for a medical service trip.